I have a love hate relationship with yeast. If I can conquer it’s finikieness I love the end result and love what yeast can become. I have been told by so many people not to be afraid of yeast or dread working with it; that it is so easy to work with and give it a chance. Well to date approximately 50% of yeast recipes I have worked with so far have come out great and the other 50% not so much. Maybe the underlying problem is that I am NOT a very patient person (in all aspects of my life) so waiting for something to rise or proof is just not in my nature. I mean when I want cinnamon rolls, or pizza, or homemade bread I want it now or as soon as now as possible; not hour (or 3) later. But despite all this I was determined to make PW’s world famous cinnamon rolls, when I choose to feature her cookbook this month. I have drooled over her cinnamon rolls for quite sometime but the whole yeast thing and waiting for them to rise and what not has been keeping me from making them. But when I decided to feature her cookbook I knew NOW was the time to make them. Actually Christmas was the time to make these for me. You see I was originally going to feature The Pioneer Woman Cookbook awhile back when it first came out but other things, and cookbooks, got in the way. And when I was going to feature her cookbook a while back I had promised myself (and my family) that I would me making homemade cinnamon rolls for Christmas morning bruch. My family was excited, I was excited and maybe our excitement caused me to rush a little bit when making these homemade cinnamon rolls. 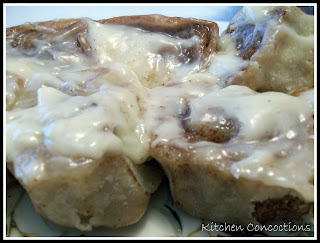 Notes: The P-Dub uses a maple icing traditionally on her cinnamon rolls (she does offer other variations for this cinnamon roll in the book) however I chose to make a classic cream cheese frosting (I have added my cheese cheese frosting recipe below). Mix the milk, vegetable oil and sugar in a pan. “Scald” the mixture (heat until just before the boiling point). Turn off heat and leave to cool 45 minutes to 1 hour. When the mixture is lukewarm to warm, but NOT hot, sprinkle in both packages of Active Dry Yeast. Let this sit for a minute. Then add 8 cups of all-purpose flour. Stir mixture together. Cover and let rise for at least an hour. After rising for at least an hour, add 1 more cup of flour, the baking powder, baking soda and salt. Stir mixture together. (At this point, you could cover the dough and put it in the fridge until you need it – overnight or even a day or two, if necessary. Just keep your eye on it and if it starts to overflow out of the pan, just punch it down). When ready to prepare rolls: Sprinkle rolling surface generously with flour. Take half the dough and form a rough rectangle. Then roll the dough thin, maintaining a general rectangular shape. Drizzle 1/2 to 1 cup melted butter over the dough. Now sprinkle 1 cup of sugar over the butter followed by a generous sprinkling of cinnamon. Now, starting at the opposite end, begin rolling the dough in a neat line toward you. Keep the roll relatively tight as you go. Next, pinch the seam of the roll to seal it. Spread 1 tablespoon of melted butter in a seven inch round foil cake or pie pan. Then begin cutting the rolls approximately ¾ to 1 inch thick and laying them in the buttered pans. Repeat this process with the other half of the dough. Let the rolls rise for 20 to 30 minutes, then bake at 400 degrees until light golden brown, about 15 to 18 minutes. For the frosting, mix together all ingredients listed and stir well until smooth. It should be thick but pourable. Taste and adjust as needed. Generously drizzle over the warm rolls. Or you can use my more traditional Cream Cheese Frosting. Using an electric mixer, beat the butter at medium speed until creamy. Add the cream cheese and beat until combined. Then add the vanilla extract, milk and powdered sugar and beat at low speed, occasionally stopping to scrape the sides and bottom of the bowl, until light and fluffy. 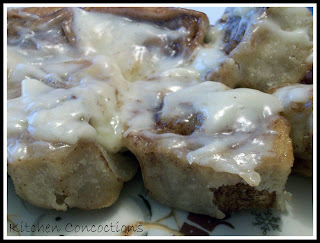 I have made these rolls numerous times (sometimes I add bits of apples tossed in cinnamon yummmy) anywho I usually make the dough the night before and let them rise in the fridge that way in the am you can just roll out and let them rise again wile the oven is warming up. They are sooo worth it. Thanks for the tip! I will definately have to try these again and take your advice! I hear you with the love/hate relationship with yeast. I think I have that same issues. This is why I adore my breadmaker.